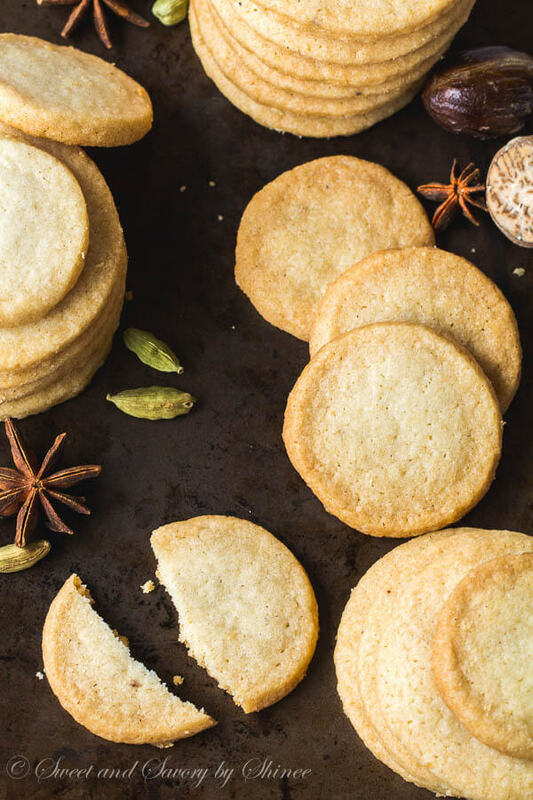 Delicate, buttery, rich shortbread cookies infused with variety of spices. These are by far my favorite cookies this season. So are you baking a storm for the holiday season? What are you having on your cookies and treats tray this year? Are you participating in any cookie swaps? Sorry for bombarding you with bunch of questions right of the bat. But I have to admit that my cookie baking season was back in October! And now I’m not really in shape for cookie baking. Really for any baking or cooking for that matter. 3rd trimester fatigue is a real thing, my friend. It just hit me this past weekend! All I want is lay on the couch. Then laying gets uncomfortable in like 15 minutes. I’m always tossing and turning, changing from laying to sitting, sitting to laying, with 100 pillows around me. ? Anyway… Before things got uncomfortable, I’m so happy that I did participate in The Great Food Blogger Cookie Swap. This is my second year taking part in this awesome program. We, bloggers, don’t only get to exchange cookies, but we also raise money for Cookies For Kid’s Cancer. So this makes our cookie swap not only fun, but also meaningful! I simply ❤️ it! Last year, I made these pinwheel cookies for the swap. They’re no doubt one the tastiest cookies. This year, I made my all-time favorite: shortbread cookies! Buttery rich and crumbly, shortbread cookies will always be my top pick. 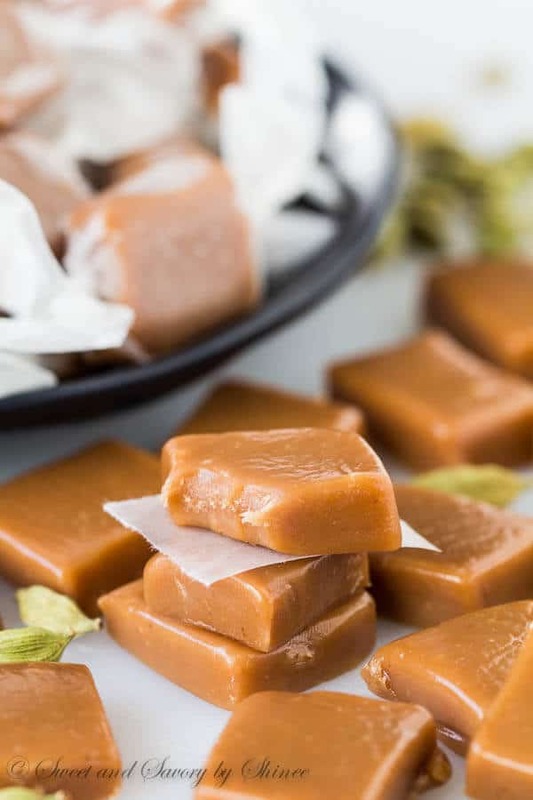 And you know how I’ve been head over heal with cardamom this season. I mean, I’ve shared one, two, three cardamom recipes already!!! 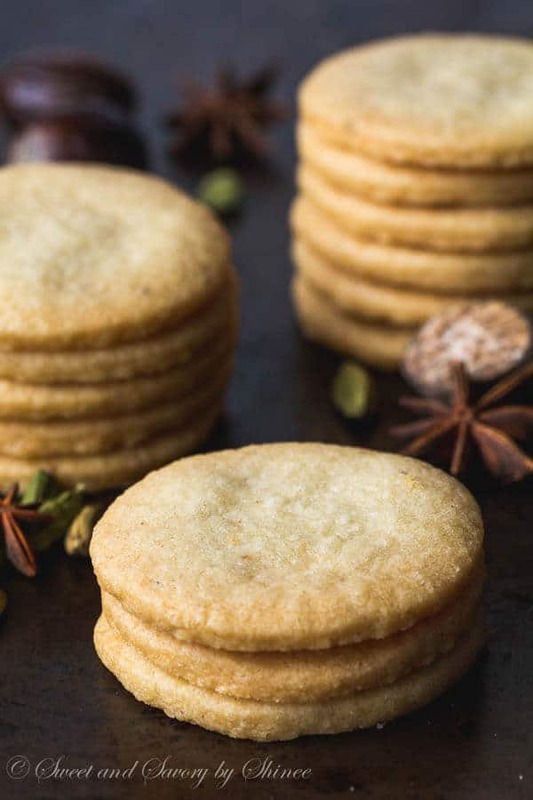 So yeah, I infused these shortbread with a healthy doze of cardamom as well along with other aromatic spices. I like my shortbread cookies on a thinner side. They’re so crumbly and delicate that way! 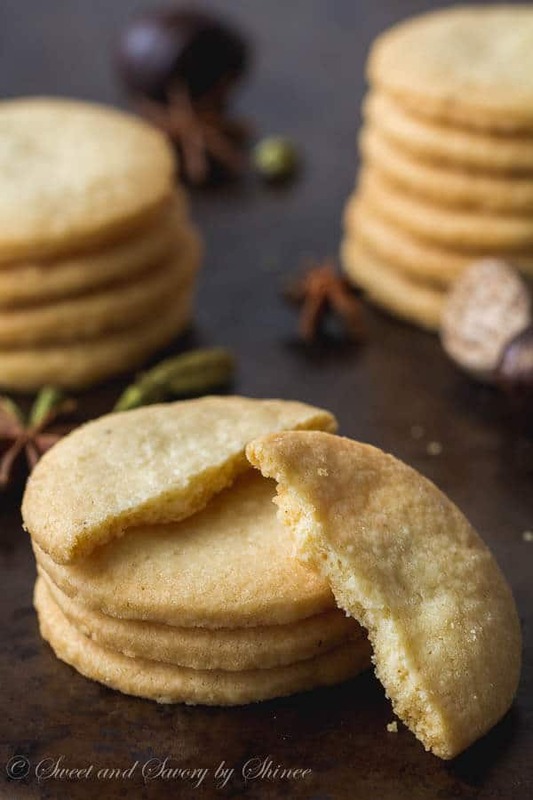 I’m using basic shortbread cookie recipe here, but infused with fresh spices: cardamom, ginger, nutmeg and anise. There are a few things to keep in mind when making shortbread cookies. It’s important to use fresh butter for these cookies, as it’s the main flavor component of the cookies. If you use stale butter, you’ll taste that in your cookies. And make sure to buy unsalted version too. Don’t beat the butter and sugar as if you’re making a cake. Creaming the 2 ingredients until just combined and slightly fluffy is sufficient. Over-beating incorporates too much air in the dough, which will prevent the cookies hold its shape. Also, don’t overmix the dough after adding the dry ingredients, or the cookies will get tough. Shortbread cookies, actually butter cookies in general, are best when they’re fresh, cuz butter tend to absorb surrounding odor and flavors. But storing the baked cookies in an airtight container in a cool place is fine. For no longer a week though. As for spices, I highly recommend using whole cardamom pods and whole nutmeg and grating them yourself for the best result. They’re much more fragrant and have ton of flavor! I bought a bag of green cardamom pods off of Amazon. And here is what I do: I lightly toast a few pods in a skillet for about 5 minutes or so. Then shell them and grind the seeds in a small mortar and pestle. Super easy and aromatic. As for whole nutmeg, it’s easier yet. I also bought them on amazon. Basically, you will crack the shell as you would with any whole nut. Then just grate it on microplane zester as you need it. 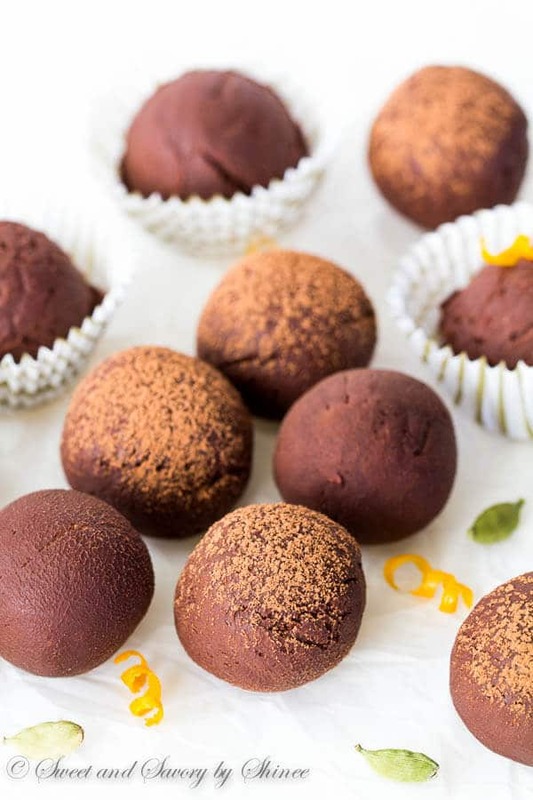 Butter is amazing at absorbing these delicate spices and the final cookies are simply divine! Hope you’ll add these cookies to your holiday baking. Thank you for reading! In a medium bowl, whisk together flour, salt and spices. In a large mixing bowl, beat the butter, sugar and vanilla extract until fluffy (not too fluffy though), about a minute. Add the dry ingredients and mix until combined. Dough will be quite soft at this point. Divide the dough into 2 equal disks and wrap with the plastic wrap. Refrigerate for about 1 hour to firm up. Preheat the oven to 325°F (160°C). On lightly floured surface, roll the dough into somewhere between ¼-½-inch thick disk. (The quantity of cookies will depend how thick your cookies are. I like mine on thinner side, so I rolled into a little thicker than ¼-inch.) 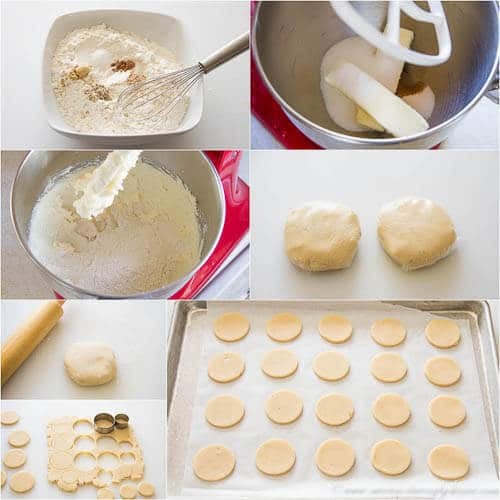 Using 2-inch round cookie cutter, cut out as many cookies as you can. Gather the scraps and repeat. Repeat with the other disk. Arrange the cookies on a baking sheet lined with parchment paper, at least 1 inch apart. Bake the cookies one sheet at a time for 15-18 minutes, or until golden. Cool the cookies for about 10 minutes on the baking sheet, and then transfer them onto wire rack to cool completely. 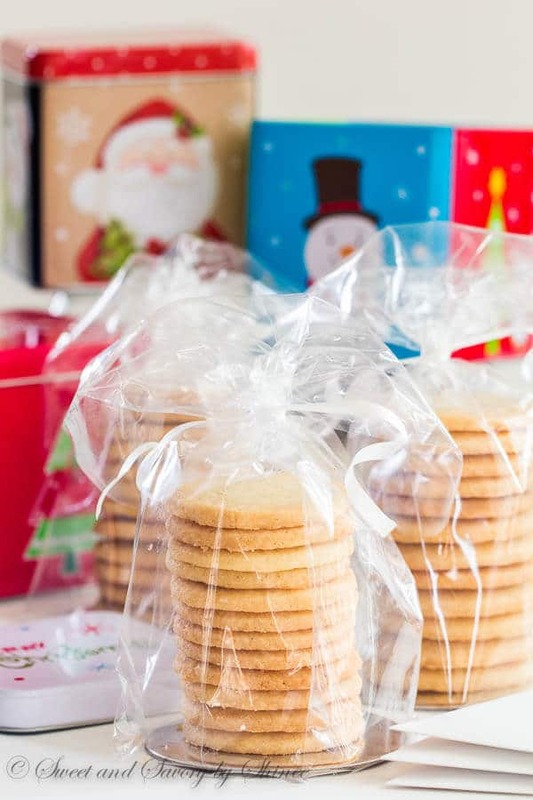 Store the cookies in an airtight container for up to 1 week. Shortbread cookies are the best when they’re fresh though.